Hear from our President & CEO, Paul D. Daugherty, on the history of the EAG and the benefits of participating in the EAG Planning Session. NOW is the time to get involved with the EAG if you have any interest in education funding! 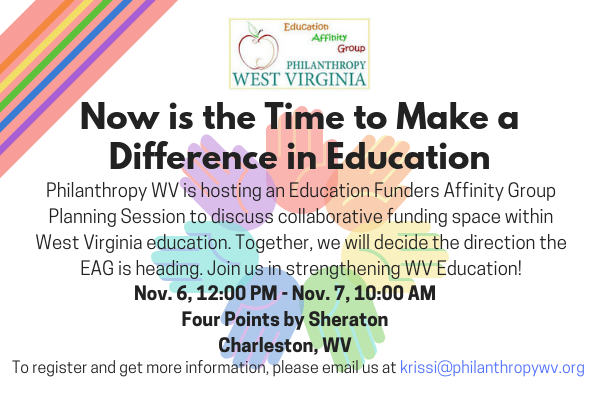 We will be hearing from Assistant Superintendent, Dr. Jan Barth, of the WV Board of Education to kick off our event on November 6th! She will take us through areas of education that are in serious need of attention. Help our teachers and students; join the Education Funders and shape the future. For more information on the Education Affinity Group, please go to the EAG page on our website. To register for this event or for more information, please email Krissi on our team at krissi@philanthropywv.org.